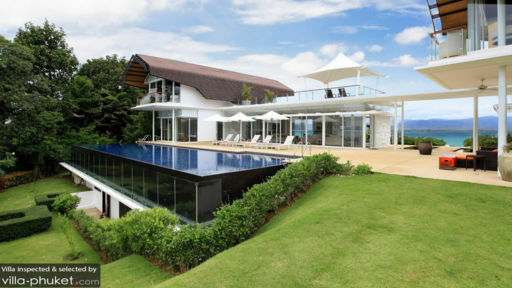 Found amidst the luscious hillside of Cape Yamu, Phuket, as part of a private villa estate, Villa Sapna is a modern, two-pavilion, holiday retreat that connects directly to the beach offering its guests a lavish experience, complete with a stunning panorama. With five bedrooms, including a family room and living/dining pavilion, the villa is best for family holidays, especially if you’re traveling with children. With numerous amenities on offer including a multi-purpose gym, massages, spa treatments, etc. there’s nothing you wouldn’t have access to here! With five bedrooms, the villa is ideal for large groups of travellers who are on their tropical adventure. The master bedroom is found adjacent to the family room, leading to the garden, and is furnished with a king-sized bed, from where you can explore the landscape with your eyes through the glass walls. The contemporary décor features bright colours complementing the outdoor view. Two of the guest bedrooms are found on the top floor of the family room with even more stunning views. Each is furnished with double beds and connects to a patio or a balcony. The fourth bedroom is found next to the living area and opens to the pool and garden, again fitted with floor-to-ceiling glass walls. The air-conditioned bedroom is furnished with a double bed and a lounge area with TV. Above the living area is the fifth and last bedroom of Villa Sapna with similar floor-to-ceiling glass walls and double bed. All the five bedrooms are air-conditioned and have en-suite bathrooms. Trimmed hedges, hilly landscapes, luscious gardens, and towering trees are only some of the gorgeous, restful sights in front of you. As the kids play around on the grass, you can relax in the private, infinity pool, that overlooks the ocean. 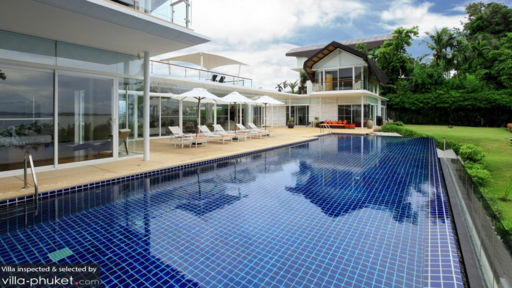 With a drink in hand, float on the surface of the pool’s cool water as you bask in the peaceful ambiance of Cape Yamu. Sun loungers are found on the deck, for sunbathing or taking a nap! The stunning panorama including the clear blue skies, emerald green gardens, and the sparkling water of the ocean with the hills in the distance, is everything you need to feel truly rejuvenated. The villa has two distinctly-decorated pavilions, one of which is the living/dining pavilion and the other which is a family room. Villa Sapna is essentially like a glass house with floor-to-ceiling glass walls to allow guests to make the most of the stunning scenery. The living room is furnished with a colourful and bright L-shaped sofa with floral patterns as well as contemporary artwork on the walls. The wooden-flooring really creates a homely and cosy ambiance for guests. The family room is a more luxurious, and comfortable, space with a lavish sitting corner with plush, white couches, wooden floors, and endless views. A media corner comprises a massive, flat-screen TV with surround sound, DVD, and other amenities. There are comfy couches here as well, so you can snuggle with friends and family for a restful experience. The dining pavilion has a lengthy dining table that can easily accommodate 14 people. A modern kitchen that is fully-equipped and fitted with excellent amenities is also accessible to guests. Besides being fully-staffed, Villa Sapna also offers several amenities to guests including a fully-equipped, multi-purpose gym with views of the garden and the ocean. The staff can even arrange for spa treatments, massages, babysitters, and other services for guests, however, these are at an additional cost. 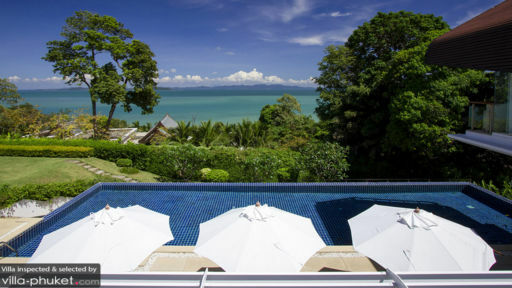 In a beautiful location such as Cape Yamu, where you are tucked in between Phang Nga Bay and Sapam Bay, you will be privy to few of the most beautiful sights and sounds around. Relish in the private and quiet location, as you walk along the beach, sunbathe, and have a fun time. Visit the local fishing villages, shop for local fares, and have a taste of the Thai lifestyle. I have just returned from Phuket and my stay and wedding at The Bay Villa 15. I can't wait to go back. I had a great time there as the villa has an amazing view and the Villa staff an amazing heart. I felt totally at home with the service delivered by everybody there, they are so helpful, and the chef cooks some amazing well presented Thai food, I had the best prawn cakes ever and I have been living in Asia for 7 years, travelling to Thailand very often. You have plenty of space, a great swimming pool and people that will go the extra mile to assist you with any request. The property owner was also in touch with their staff to make sure we have a pleasant stay. Couldn't have made a better choice for my stay and wedding. Thank you so much all of you. We had members of the immediate family getting-together from different parts of the world after more than 2 years. The idea was mainly to spend time together in a comfortable setting, with some golf, food and drink. Villa 15 surpassed our expectations on every single level. It is a 5 bedroom villa with some of the most amazing views we have ever seen. No matter which room you are in or which direction you look, you see blue skies, an even bluer ocean and green hills in the distance. You can exercise on a cross trainer with perhaps the best views you will ever see from a gym and the pool is large enough for a serious swimmer to do some lengths before the cocktails are served. There is plenty of space in the villa to relax with everyone else, or just get some alone time when you need it. The staff are exceptional - fantastic food to match any Thai restaurant and service you will never get. Their friendliness and attention to detail was amazing. It was almost as if things were being done by invisible people - rooms were cleaned, messes were tidied-up without us even knowing it was being done. The villa is not connected to a beach, so you will need to drive somewhere if you want to build some sandcastles, but the location and the villa itself meant that we didn't miss the beach one bit. HIghly recommended for a family get-together or a celebration with a bunch of friends - we will definitely be planning a trip back next year. What an unbelievable villa, chic and luxurious in a most unique location with stunning views of the glorious blue sea from every side of every room. Sunrise on one side and stunning sunset from the deck with cocktails in the evening. From cappuccinos at sunrise, anything your heart desires for breakfast, superb Thai salads for lunch, canapés and cocktails at sunset and splendid feasts for dinner, the catering was outstanding. The staff just cant do enough and the attention to detail from towel sculptures on the beds, orchids on the towels, presentation of everything was just amazing too. We indulged in massages every day all very easily arranged. A secret path at the bottom of the garden amidst frangipani trees and orchids leads you to a stunning beach, wild and wonderful for morning walks or picnics the chef can pack. A short long tail boat ride away is an island with beaches that are great for swimming. Under a half hour drive you can enjoy the more buzzing Surin. Layan beaches with beach clubs and bars, the charming heritage Phuket town with a great Saturday night market . Cant recommend this villa enough fir a fantastic pampering relaxing holiday with friends or family.